Readers of all ages are welcome to join our book discussion groups! Ask your local library about discussion group meeting times as well as the current book. Depending upon the library, the materials may or may not be provided prior. Check out our Events Calendar for the full county listing of book discussion meeting dates. 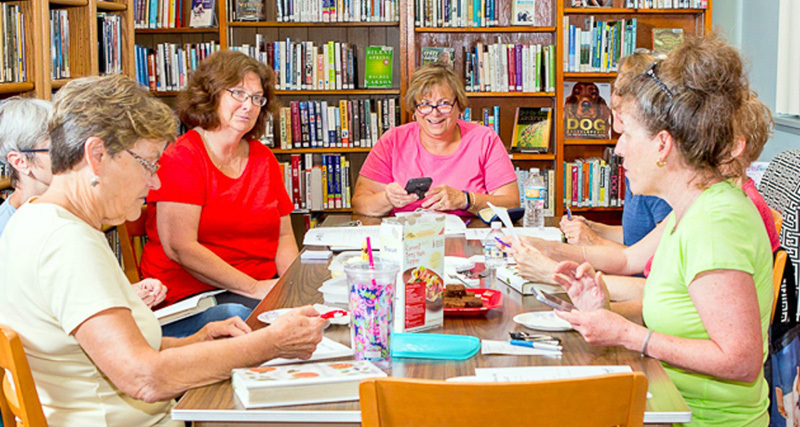 From mystery to fiction, to everything in between, York County Libraries offers a variety of unique book discussion groups for everyone to enjoy! Across the county, you will find a wide range of book discussion groups who meet at various times for your convenience. With many themes of books changing monthly, our discussions are full of interesting topics and lots of laughs! Unique to their areas, some discussion groups will have meetings in local places, while others get comfortable in their home library. Once you’ve visited your local library’s book discussion groups, feel free to visit the other libraries’ groups as well! Book Discussions are no longer just for adults! Throughout the year, various libraries across York County will hold monthly or weekly book discussion groups for teens. In our engaging group discussions, readers will bring the current featured book, or their own personal favorites to share! The kids of York County Libraries also have their own book discussion groups! From month to month, new books are discussed with varying themes and genres. Led by one of our friendly staff or volunteers, our book discussion groups will have you in a fit of giggles by the end! While discussion of story plot, themes, and characters are important to the group, we also incorporate unique book-related activities such as crafts and games to make the story come to life!